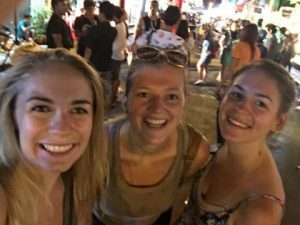 Kathy and friends out on Bangla Road in the “infamous” city of Patong. 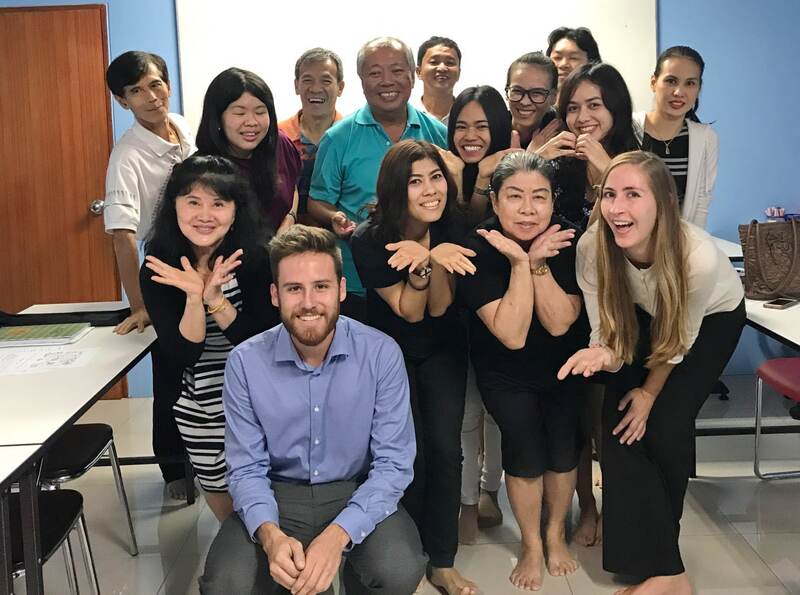 Week two of our onsite TEFL course brings new challenges, fresh opportunities to practice teaching English in Thailand and critical lessons in areas such as classroom management and language awareness. 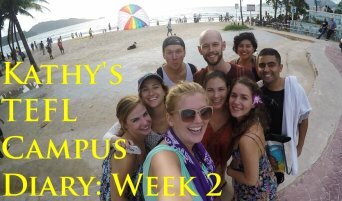 We wanted to help people learn more about our course from a trainee’s perspective so we asked Kathy (USA) to help us with a weekly diary. We already learned about her first week and it’s safe to say she settled into Phuket Town rather comfortably. 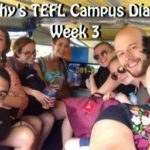 What did you do over the first weekend of the TEFL course? After a long week, full of new information, we decided we needed to celebrate. 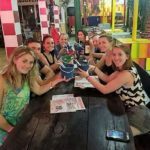 My classmates and I hopped on a bus and headed for the famous, or as some would say infamous, Patong. It wasn’t what I would call “a nice relaxing weekend at the beach” but we had a fantastic time! 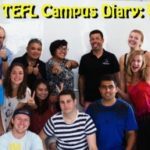 Are you settling into the TEFL course routine? I am. Class doesn’t start till 9:30 am which is pretty amazing coming from a job that starts at 7:30 am every day. When I’m not teaching in the evening I get to leave at 12:30 pm, grab a nice lunch, catch up on studying and relax. When I do teach I have two and a half hours to plan and depending on if I have the early class or late class I get a little break in between planning and teaching. How did you feel before your 2nd observed teaching practice session? 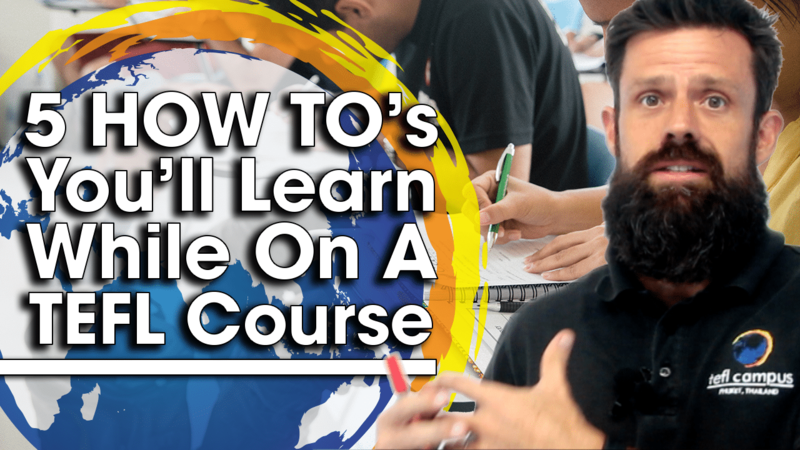 I felt much more confident going into my second lesson because I understood the teaching strategy better, and I was ready to improve. 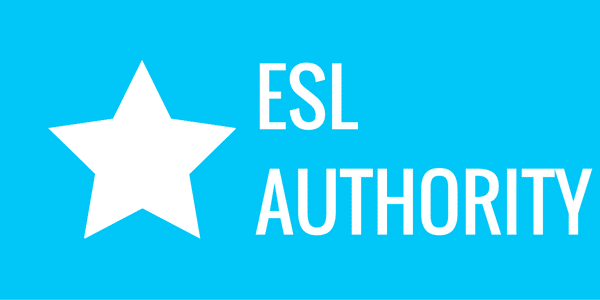 In my first lesson I explained my main activity rather than demonstrate it (which is a big no-no in teaching ESL) so I wanted to focus on that. In my 2nd lesson I nailed my demonstrations and the students preformed the activity with clear understanding! As in any lessons there were strengths and weaknesses but overall I was very pleased with my lesson. 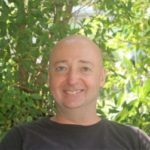 Did lesson planning get any easier? In the second lesson it was much easier to plan because I still had about 90% support from my instructor. On the third lesson I was given a little more independence which had its challenges but that’s what I signed up for. 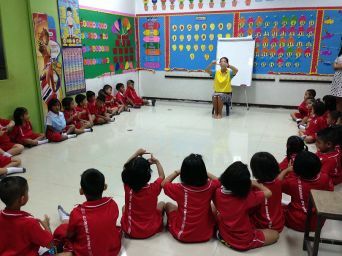 You received some tips on classroom management. Have you been able to use them in the classroom yet? Definitely. All of the students I have taught have basically been no problem at all. Setting the tone at the beginning of class, keeping my lessons fun and engaging, and making sure everyone is participating is key to having good classroom management. After 6 hours of lecture on English grammar, does it seem more or less daunting? More or less interesting? The first day I thought, “Oh no, I have literally forgotten everything about the English language!” But after the six hours of grammar and detailed breakdowns of how different parts of speech work, I feel much more comfortable. 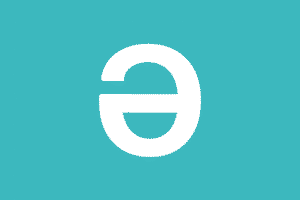 This is a schwa. 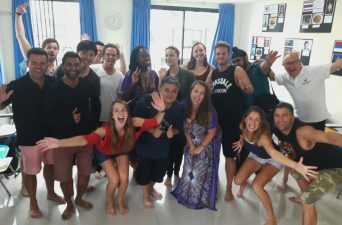 During phonetics lessons, TEFL course trainees learn about this and the other 43 phonetic sounds of the English alphabet. You’ve also sat through 5 or so hours of phonology lessons? What do you think of the Int’l Phonetic Alphabet (IPA)? Are you more aware of how we make sounds within a language? I actually really like the phonology lessons; it makes me feel like I’m a code breaker. 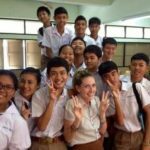 The lessons make it easier to hear all the different sounds and understand how to break down words and help students with their pronunciation. 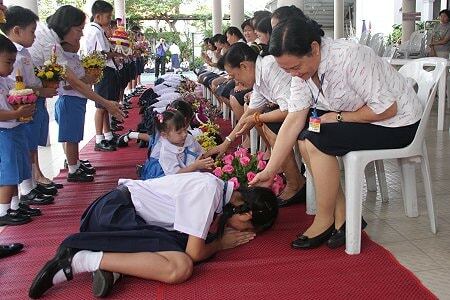 School lets out on Friday at 12.30 every week. Is this enough time to relax over the weekend and have some time to explore Phuket? 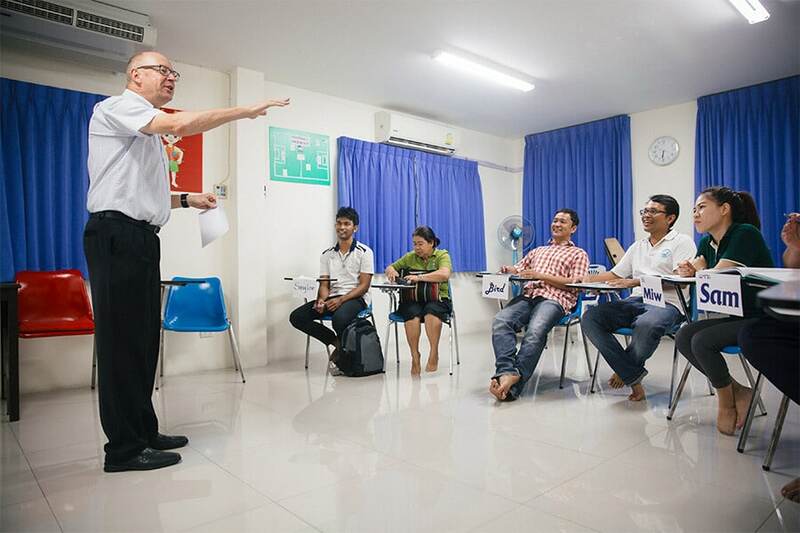 I stay after on Fridays to take Thai lessons so I’m in class till 4:00 pm. But the weekend is plenty of time to get out and explore. It’s very easy to get to the beaches, and even catch a boat to a nearby island. So what’s the plan for your second weekend? 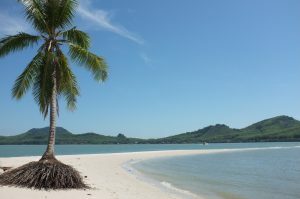 Some fellow trainees and I are headed to a nearby island called Koh Yao Yai. It’s supposed to be pretty chill so we’re all looking forward to it after last weekend in Patong. 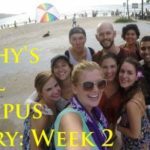 To read Kathy’s entry for Week 3, click here. 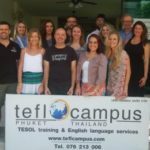 For more information on taking our TEFL course in Thailand, please be sure to contact us.